Welcome to Smugglivus 2011! Throughout this month, we will have daily guests – authors and bloggers alike – looking back at their favorite reads of 2011, and looking forward to events and upcoming books in 2012. We will also have giveaways, in order to whet the appetite! To truly kick off Smugglivus, we of course had to include an inaugural giveaway – the title up for grabs today is YA thriller iBoy by Kevin Brooks. For more information about iBoy and the latest in Scholastic’s YA titles, make sure to check out the official ThisIsTeen Facebook Page. 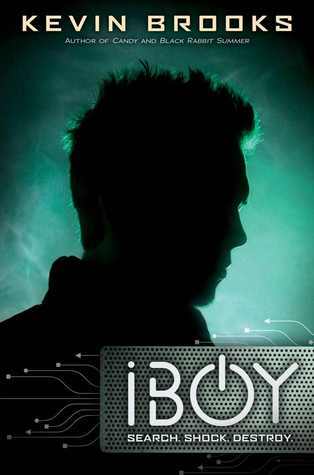 We have ONE copy of iBoy up for grabs. The contest is open to addresses in the US and Canada only, and will run until Saturday December 3 at 11:59PM (PST). In order to enter, leave a comment here letting us know what your favorite techno-thriller book, film, or comic is. Good luck! I actually don’t think I have read any techno-thriller books but I would love to start with this one! Techno-thrillers are new to me and the main reason this book caught my eye is because of element of technology. Tom sounds like an intriguing character. Like everyone else, I also have never read a techno-thriller, but would love to start! I don’t think I’ve read a techno-thriller either, but this book sounds very interesting. Thanks for the giveaway! Jurassic Park was my first techno-thriller, so I’ll go with that movie. What about Evil Genius by Catherine Jinks? It has a lot of computery stuff…does that count? I’m not sure what classifies as a techno-thriller, but I really like books that include new technology that could be the next new thing in real life. The matrix. It was released more than 10 years ago and it is still an excellent movie. Close call between Neuromancer and Cryptonomicon. Both out of this world but I’m going to have to go with Cryptonomicon because it’s impossible to finish in one sitting thereby enhancing the suspense. Techno thriller? I like the term.. I read the Joe Ledger books by Jonathan Maberry, starting with Patient Zero. These were pretty intense. I’ve never read any techno-thrillers, but this book sounds intriguing! I was a huge fan of Crichton back in the day, and Stephenson is great, but these days I seem to be getting my techno within dystopian YA. I haven’t read a lot of techno-thrillers, but Human.4 by Mike A. Lancaster was really interesting and chilling. I don’t know if Awaken by Katie Kacvinsky would count, but there is a technology/internet plotline. I was surprised by how much I loved Awaken. Thanks for the awesome contest! I don’t remember the name or author, but it was about a future society where everyone was “online” so to speak with the internet via implants directly into their brains, and the outcasts were those not hooked up. Don’t know that I loved it so much as that it stuck with me, in one of those creepy, “Is this what is starting to happen” feelings I get when I see people walking around talking to themselves (OK, maybe it’s to their little ear thingies, but it still always makes me want to say, “You talkin’ to me?”, or staring at their smart phones instead of the world around ’em. I guess the Matrix would be as close a techno thriller as I get. Thanks for the giveaway. I like the Matrix. Thanks! I don’t think I’ve read any techno-thriller books but I like The Matrix movei.